Early reviews of Gateway Tower renovations are a hit among residents and neighbors alike, according to the Duluth News-Tribune. The early reviews are rolling in on the what’s-old-is-new-again Gateway Tower apartments on West Superior Street in downtown Duluth, and tenants say the renovations are a hit. “Huge bathroom,” said Pam Blommer, 55, who uses a walker and appreciated newfound accessibility after waiting for her updated second-floor apartment by spending a few months in transition on the ninth floor. Gateway Tower houses a mix of elderly people, folks with disabilities and, soon, a supervised floor dedicated to safe housing for young people. 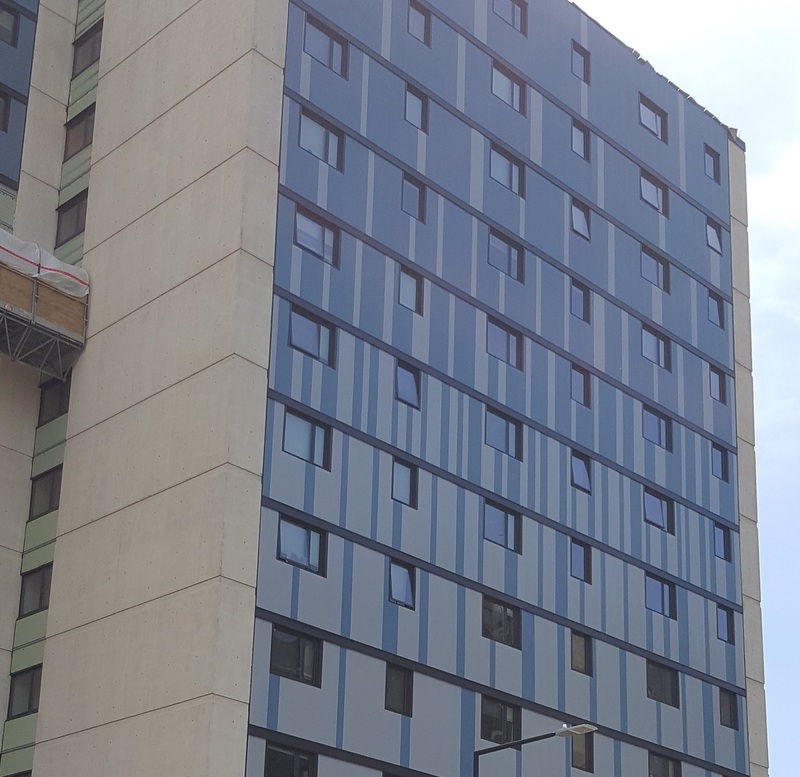 With more than 100 of 150 units already renovated and more being finished every day, the $18.5 million Gateway Tower update is on track for fall completion. Its dynamic new interior and secure entryway along Superior Street were matched in recent weeks with the application of decorative steel siding and a paint job befitting a Twin Ports blue-gray sky. The steel siding is of a different type than the cladding which covered the Grenfell Tower apartment building in London, and is being blamed for the disastrous, deadly inferno there last month. The Gateway Tower cladding is “very, very safe,” said Rick Klun, executive director of Center City Housing, one of the building’s purchasing partners. “It’s a design our architect came up with — the idea was to give some visual intrigue to the exterior of the building,” said Jeff Corey, executive director of One Roof Community Housing, which also partnered to purchase and save what had been an fast-expiring four-decade-old building. Renovated using a group investment in low-income housing tax credits, Gateway Tower now will also feature sprinklers throughout the building at Klun’s insistence. Heavy equipment work has turned to addressing the lot surrounding the tower — the digging encountering the foundations and debris from buildings of Duluth’s Bowery, demolished ages ago. Corey said money had been set aside for what he called “underground surprises,” which had been expected given the lot’s issues with cracking, heaving and sinkholes. Access the full story online at Duluth News-Tribune.